I’ve never been a huge fan of peas, but this recipe is proof there are ways to make anything taste good! And this Fresh Pea Pesto is more than just good. It’s crave-worthy. We had it slathered on crostini and tossed with pasta. The crostini, in particular, was the bomb! I’m thinking that this would be a great appetizer for Easter – or anytime. And the pasta tossed with this pesto and topped with garlicky breadcrumbs makes a great meatless meal. 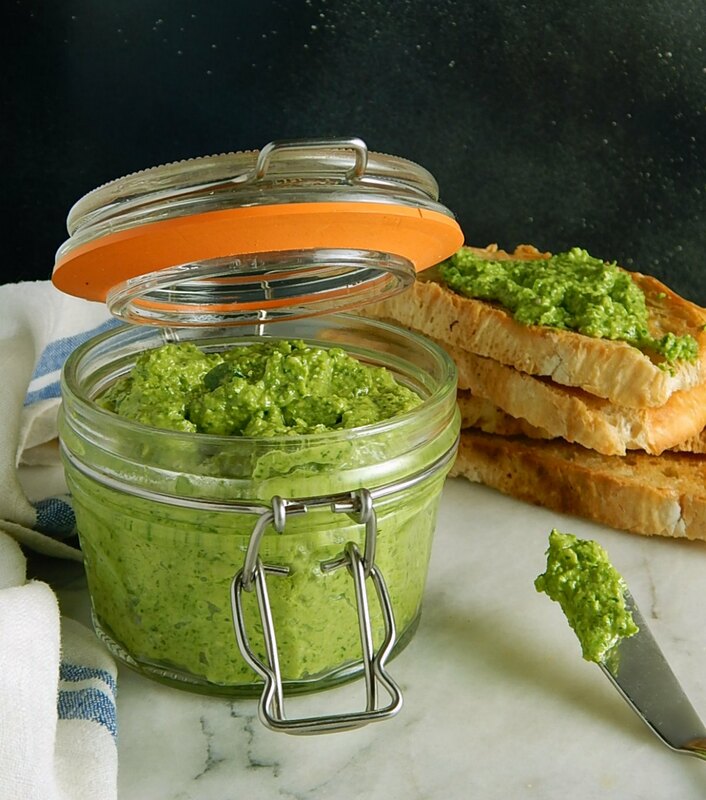 If you love peas, you’re going to love Fresh Pea Pesto, and even if you’re not wild about the strong taste of traditional basil pesto, you’re going to love this mellower version. The peas, along with a bit of spinach in the recipe, give the pesto a much milder flavor and a smoother texture and just a bit of heft that basil pesto doesn’t have. For the herbs, I chose to use a combo of basil and mostly parsley because the only herbs that have managed to thrive indoors through the winter are my parsley and my chives; that’s usually the case. But my much-pampered parsley I have in spades – and both will go outside, soon! I can’t wait! But that just goes to show how versatile this recipe is. I mean, you can’t go wrong! If anything, I think using the peas & spinach and a good amount of the milder parsley gave the other characters, the cheese, and the nuts, in this pesto a chance to shine. I just happened to have a few pine nuts from the last time I made pesto, but as long as we’re breaking rules, use just about any kind of nut you’d like. I think the softer ones like walnuts, blanched almonds or cashews work well as opposed to a harder nut like straight up natural almonds. And I broke another rule, too. I used a little chunk of asiago lurking in my cheese drawer. You can’t go wrong with just about any hard, grating cheese or a combination of them. Just like any pesto, there’s really nothing to making it. I like to break everything down into bits as much as possible before the lemon and cheese goes in, then work it into a paste before adding the olive oil. Don’t forget to scrape down the food processor as you go. Your finished product should be light and as smooth as possible, and heap, almost like a spoonful of yogurt. Garnish how you will. For the crostini, try a dab of ricotta, shavings of cheese or a few of whatever nuts you use, or even a few of your herbs tossed over. If you’re tossing with the pasta, the flavor mellows, so I recommend good homemade breadcrumbs that are strongly flavored with garlic. You can see my post on Homemade Breadcrumbs, but just heat a little olive oil, a tablespoon or two in a pan over medium heat, add a clove or two of minced garlic and then after about 30 seconds (as soon as that garlic smells fragrant) toss in the breadcrumbs. Maybe 3/4’s cup is a nice amount. Watch them closely and stir and toss now and then – they go from “when will these ever be done?” to too dark in a heartbeat! This is a perfect recipe to think about whenever you have a little spinach that needs to be used up that might otherwise languish in the fridge and it’s a great recipe to think of when you pull out that half-used bag of peas from the freezer and they’re looking a little shrively! Is that a word? It is now! I wouldn’t even hesitate to follow this basic recipe to save other veggies. Maybe a little frozen or leftover asparagus, for instance. I do really try to stock up on nuts during the late fall, when they’re always at a low, especially during the Winter Holidays when so many are on special for baking. Easter is another time you’re likely to see nuts on sale. And of course, Aldi and you Buyer’s club are usually good options. Good cheese, from the deli has a special strategy – watch for coupons when the cheese goes on sale. In my area, it is often to buy one wedge, get the second half off. I just check the brand then check the producer’s website. If you buy spinach, really do a comparison to bags and boxes to the fresh – you’re going to find the bundles of fresh spinach are a fraction of the cost of the prewashed varieties. If your spinach is all bundled with all the ends together – bonus! Just slice the stems off into thin pieces and use them for this recipe and use the nice leaves for salad! Talk about maximizing your ingredients. Add the basil, garlic, pine nuts, peas and spinach to a food processor and blitz in pulses until it breaks down into bits. Add the cheese and lemon juice pulse a few times then run until the mixture becomes pasty, stopping to scrape down as necessary. With the food processor running, drizzle in about 2 tablespoons of olive oil. The mixture should be smooth and spreadable with the consistency of yogurt. If it’s still a little thick, add the additional olive oil and if still too thick, add water by the teaspoonful. Season with salt and pepper to taste. Spread on crostini or toss with pasta. Garnish as desired; see post text. Note: be sure the Fresh Pea Pesto is highly seasoned if serving over pasta. I’ll be sharing this Fresh Pea Pesto at Fiesta Friday #270, cohosted this week by Jhuls @ The Not So Creative Cook and Angie @ Fiesta Friday. This entry was posted in Click here for Bargain Meals, Click here for Fabulous Food Posts and tagged Appetizer, Bargain Meal of the Week, Cheese, Lemon, Nuts and Seeds, parmesan, Pasta, Peas, pine nuts. Bookmark the permalink. It looks so green and fresh! This is another must-try, Mollie, simple yet delicious. Thanks Angie! I just luv this stuff!! 🙂 A great garden dish if you’re planting peas!! I love peas and I like pesto so I’d probably like this. It’d be great with a slice of Parmesan cheese. Peas for pesto – amazing idea! I love the one with pasta – yum!! Thanks for sharing, Mollie. Happy belated Fiesta Friday! Great idea to use peas for pesto. I wouldn’t have thought of it but it makes sense and looks AMAZING! This sounds so lovely, and I like the combination of peas and spinach, great for flavour and texture! The texture actually seemed a bit smoother “in person” and doesn’t that green just scream “spring?” Although almost everything is pretty brown here, still! It won’t be long! oh my goodness, i have never heard of such a thing but it looks and sounds amazing. thank you! i know i have mentioned this before but are you a professional photographer? your pictures, set-up, lighting and props are first class! Thanks so much on all counts! And no, I really struggle with my photos and only have a point and shoot camera! I did get these lights called Ergo lights second hand on ebay around the first of the year, so I’m still learning with them, but I think they help, a lot! And I love scouring the second hand shops for little dishes and things – when I die, my daughter is going to kill me because I don’t have full sets of anything…just one or two of these bowls or those glasses, lol!! She’ll have a lot of odds and ends to get rid of because it seems to be amassing! Unless it’s something I really love – and then I’ll pick up several! Oh, I am thrilled I was able to make your day. Everything I said was 100 percent true and you have such a gift……….your photos are just so clear and perfectly situated. well done………..always. You’d love this then! Peas and spring just go hand in hand!